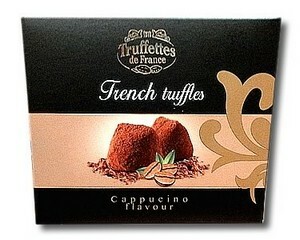 Truffette Dark French Cocoa Dusted Truffles (Cappuccino) 250g. Wonderful cappuccino truffles, soft chocolate centres covered in dark chocolate, cocoa dusted and infused with coffee. 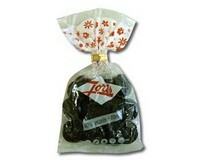 If you don't like these you don't like coffee and chocolate! Simply awesome. 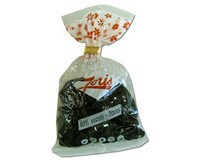 A very popular product from France where the quality simply defies the price! Ingredients: Non hydrogenated vegetable fats (palm/palm kernel), sugar, whey powder (milk), cocoa powder 1%, natural coffee flavour, emulsifier: soya lecithin, natural vanilla flavour. 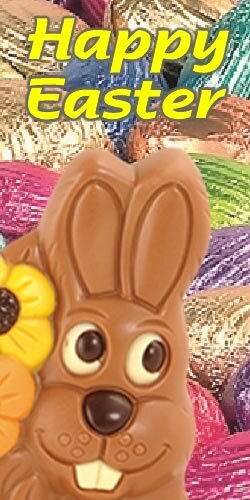 May contain traces of gluten, peanuts and other nuts.